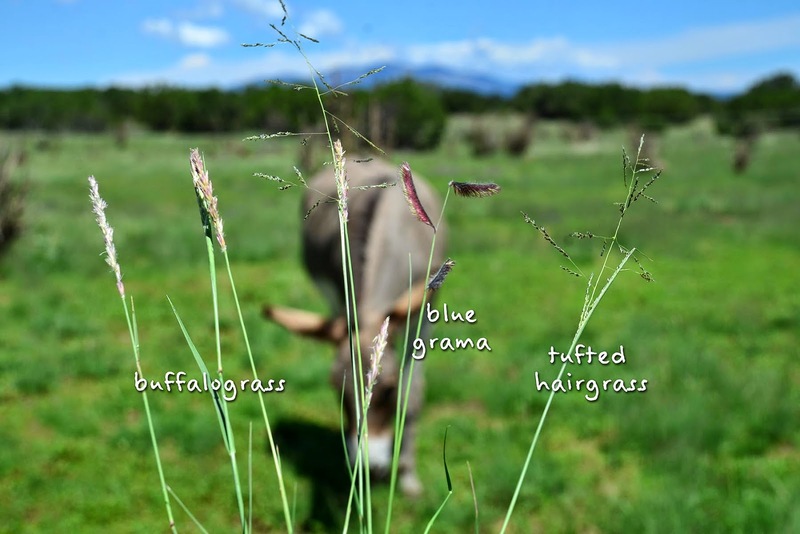 The pasture grass has grown another 6 inches since I wrote about it last week. Make that 6 and a half. No wait...7. Seriously, it's growing faster than I can type. All this green is equivalent to cash on the ground. Every day I don't have to feed hay means $11 saved. Cha-ching! There are more kinds of native grasses out there than I can identify. but I'll happily stand corrected if any of you plant identification experts tell me I'm wrong. but just a few blades at a time instead of a giant mouthful. She's maintaining her girlish figure under protest. that it would be best to leave it on full time. Lucy: What do you mean I have to leave it on all night? Me: Get a good look at it, Alan. Your day's coming. Grazing muzzles for George and Alan have been ordered and should arrive this weekend. 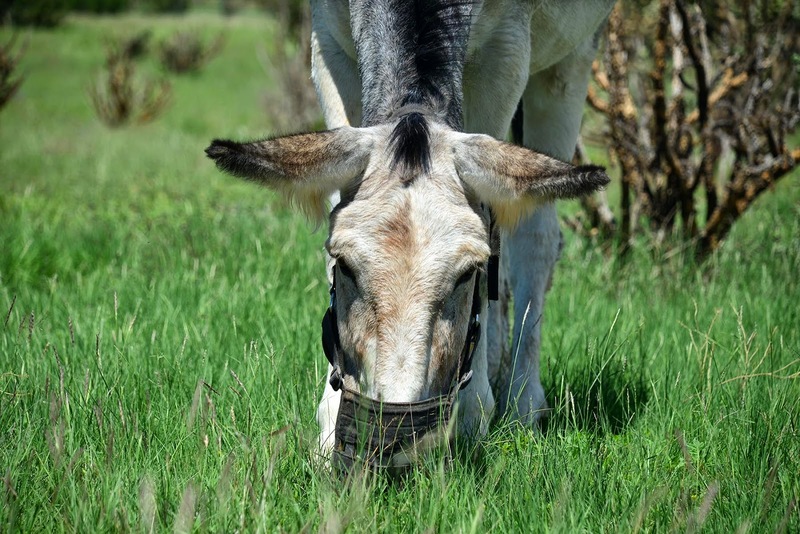 but something tells me I'll be spending all the money I'm saving on hay on lost grazing muzzles. Smooch and her feet, Lucy and her eating habits, George and Alan up next. Is he behaving himself ... and would he feel compelled to remove any grazing muzzles from his herd? The pastures look so green. 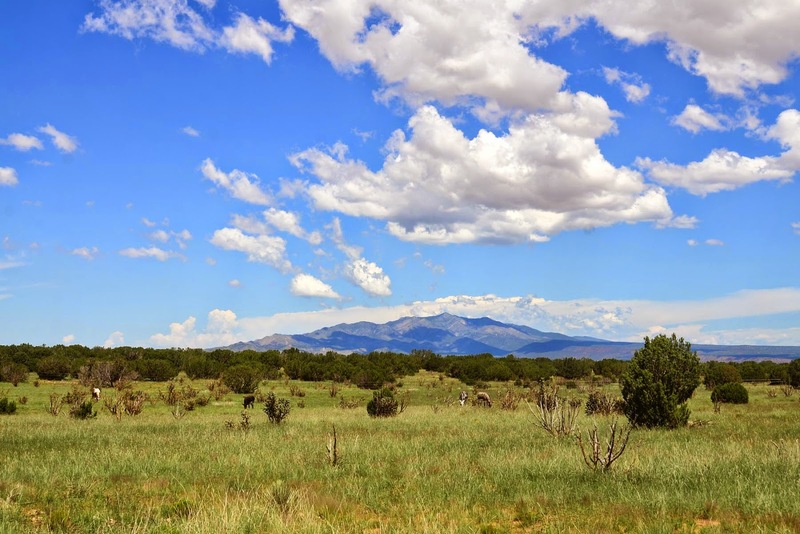 Even the local weather forcasts are mentioning all the monsoon rains in Arizona and New Mexico. At least the wet stuff is falling during warm weather. Hank wouldn't dream of doing anything as devious as removing a grazing muzzle...I hope. Added to shopping list: reflective tape. Great idea. Thanks! 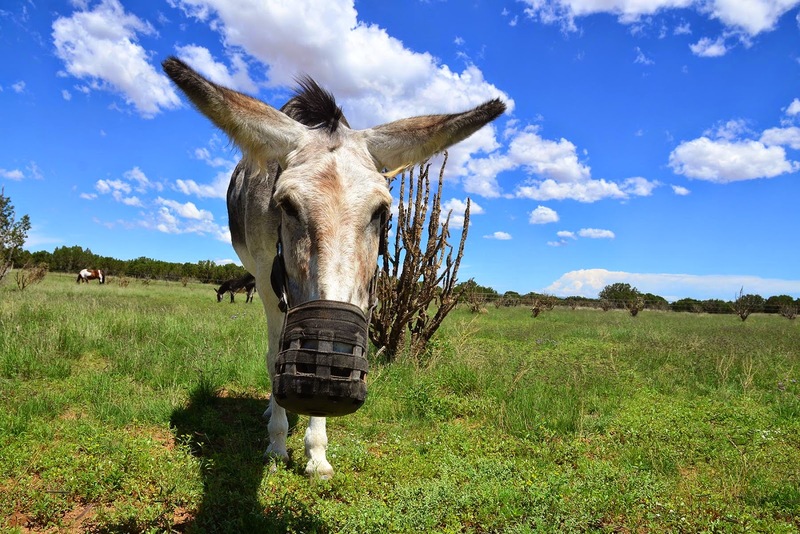 so the rain saves you money on food, but you have to spend the savings on muzzles because there is to much food to control... i must have been a donkey in my other life because i need a muzzle to. Putting refelective tape on the muzzles (or flymasks) makes them fairly easy to spot at night with a flashlight. I'm considering them for my donkeys, but am having the darndest time even finding halters that fit properly! Is there any cure for that spot on their noses that gets rubbed by the muzzle? If there is, I haven't found it. The hair grows back quickly, though, as soon as Lucy stops wearing hers. Lucy doesn't hide her disdain of the grazing muzzle very well. Lol I hope George and Alan don't figure out a way to get their muzzles off. Although my money is on them figuring out a way! ;) I don't think they will get any assistance from Hank...that means more food for him! Maybe it was mentioned in another post and I missed, but did the baby pronghorn finally leave the nest? Yes and no. He no longer lives here but has been stopping by for the occasional visit. Love "Natalie in KY"'s suggestion of putting orange tape for visibility on the grazing muzzles - that color should stand out your oh-so-green pasture (that's really an incredible sight, you know) should somebody somehow be able to get one off. The grumpy herd will need to seek other sources of entertainment. Visitors perhaps? I don't think I have ever seen so much green in your pictures! I think it is my favorite color. Are you still getting regular rains as well? Do you leave the herd out all day to graze or do you pen them up for part of the day when the grass is this lush? It hasn't rained in a week or so, but monsoon season isn't over yet so there's a chance we'll see more. The herd is out 24/7, hence the need for the grazing muzzles. I've read that equines penned up for part of the day make up for all lost time once they're let out to graze. So rather than have them binge for 12 hours, I'd rather have them nibble for 24. I don't know how you do it. 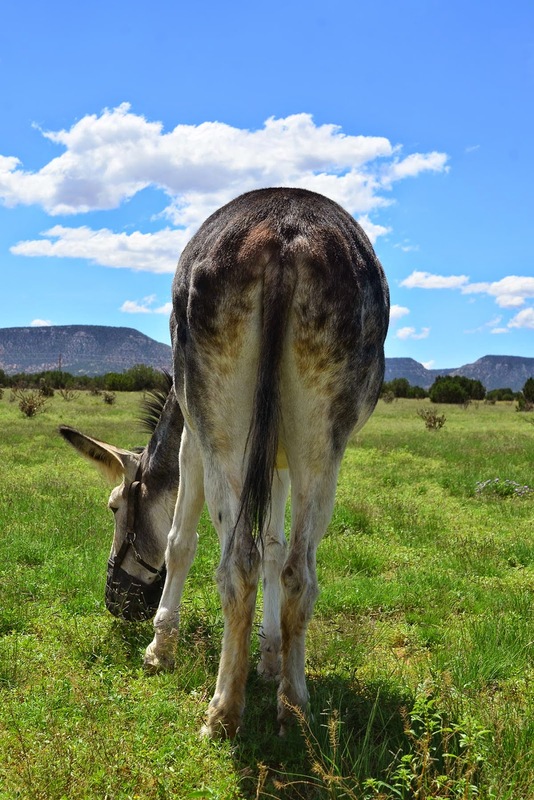 Your pictures are so crystal clear that they almost appear to be 3-D.
Do you let the herd in the yard to clean it up or just true to keep it cut yourself..? 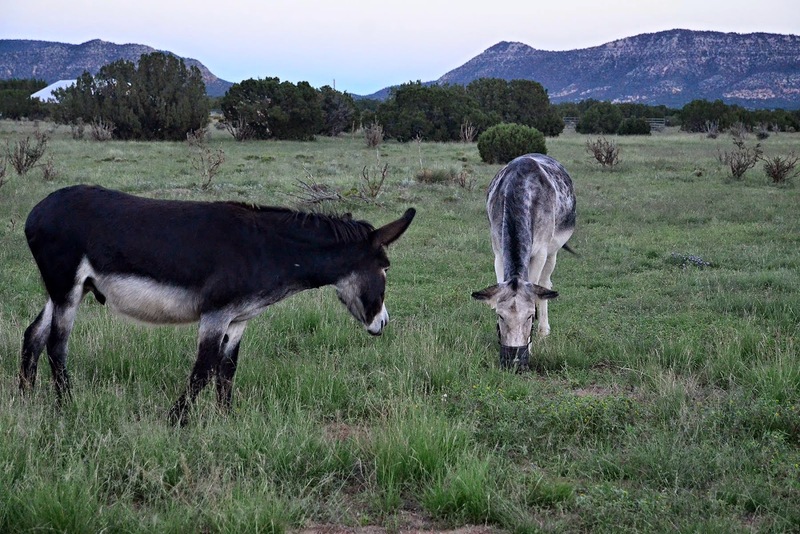 Somehow I think you are right and the magical burro brothers will find a way to get each other's muzzles off of each other! your maintenance is very amazing.I don't know how you do it this work..keep doing..